The time has come for me to begin painting this month's main attraction, the Eldar; I've added enough red, brass and cream trim to my Barracuda for the moment and Forgeworld haven't sent the new cockpit yet so it sits on my shelf waiting to be completed. 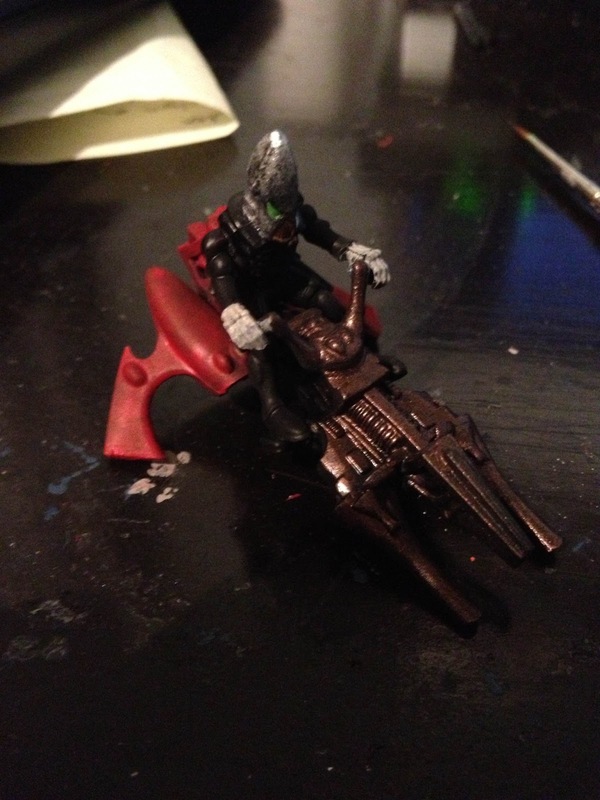 And so I turn to the pile of jetbikes. Painting troops is one of those things that needs doing to make an army and to be honest bikes aren't as fun to paint as the wonderfully detailed Rangers I'd just finished. 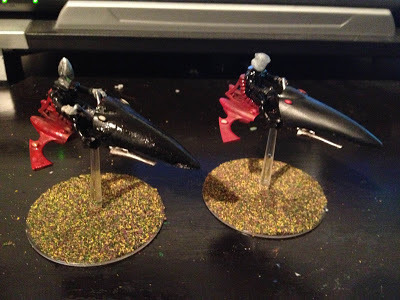 I'd already painted one unit of bikes, The Mark of Anticlea, and so the first decision was whether to make this unit look identical or have them stand out as different. With my Tau I had neat ranks of blue-and-grey infantry, as fitted their futuristic soldier aesthetic. Similarly my Chaos army was entirely silver marines with one gold shoulderpad and red or blue cloaks. Turning to the Eldar codex I read up on Saim-Hann, the craftworld which had inspired my army. 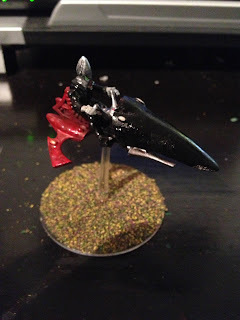 It said Saim-Hann jetbike squads each tended to be all made up from members of one family and so a little bit of originality seemed logical. A four-colour scheme like I had picked (silver, cream, red and black) gave plenty of permutations for different units to all look similar, but slightly different. Thus while the first unit were red bikes with black prows, white gems on the wings and red gems on the prow, this unit would have white gems on the prow and gold gems on the wings. 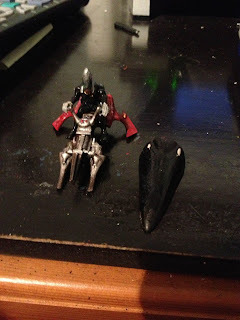 What's more, I'd put more effort with this unit into picking out details like the buttons on the uniform, the control panel screen and so on since I hadn't converted the riders so much (my first unit all had hooded riders, while this one had traditional phallic helmet Eldar). 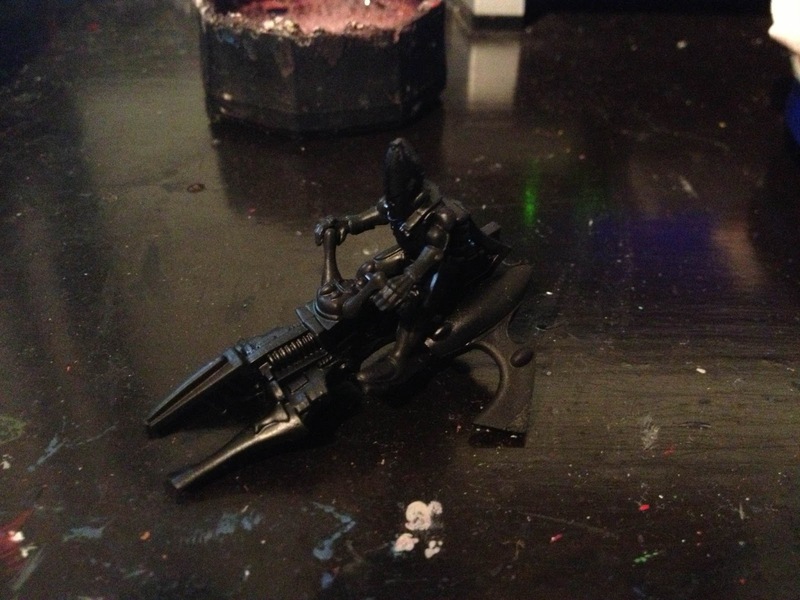 An undercoated jetbike; leaving the prow off allows me to paint the guns more easily. Step 1 was getting the base colours on the two halves of the bike. The rear section received a coat of Khorne Red and the fore section a coat of Warplock Bronze. The table receives a coat of Rakarth Flesh. In Step 2 I added the detailing to the rider; the eye lenses were painted Goblin Green, the helmet Ironbreaker and the grille and buttons were Dwarf Bronze. To make the riders stand out from their fellows, I painted the gloves with Rakarth Flesh. 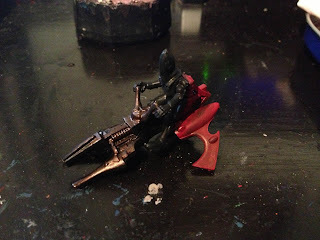 In this stage I also was able to add a second coat to the red section of the bike - using a trick Ben used on his Rangers, I tried stippling the bike with Mephiston Red. Since I had another 5 of these to paint I wanted to keep the total number of stages comparatively low. Step 3 thus entailed a drybrush of Ironbreaker on the fore section of the bike, picking out the gems with Rakarth Flesh and Dwarf Bronze, and stippling the entire bike with Ardcoat varnish. The rider's black armour also got a coat of varnish in line with my other bikers. The painting done, it was time to leave it to dry. 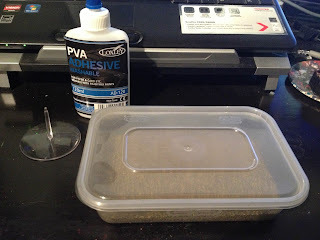 The final stage of the process was the basing. I'd recently bought some model railway vegetation - Javis' Countryside Scenics Scatter No.70 "Summer Mixture" to use with this army, because the flock I'd used for my previous two looked a little bit too much like cricket nets or an artificial tennis court. And with the base done, the first biker from the second unit, named The Mark of Cicuta, was completed. The new bike look, on the left, next to one of the first unit's models. I'm looking forward to trying the stippling effect on something bigger than just a bike - at some point I plan to get a Crimson Hunter and will go for something similar on it. Similarly, stippling the varnish to give a less uniform effect looks, I think, how I'd imagine wraithbone to look - kind of organic but polished. As I work on this unit I'm going to look for ways to add subtle variations to each squad member; things like different coloured gloves, lenses and buttons seem obvious. Once they are done I've set myself a more ambitious project - convert an Autarch with the Mantle of the Laughing God. Quite what he'll look like is a mystery at the moment but he needs to look very flashy.